One of the nation’s best-known convenience store chains, 7-Eleven, could carry CBD products in up to 4,500 franchise locations across the United States by the end of 2018. Phoenix Tears, a Denver company that makes hemp-derived CBD oils and oral sprays, announced the distribution deal Tuesday. The Denver company made the 7-Eleven deal with the help of MarketHub Retail Services, a distributor that works with 7-Eleven franchisees. “This agreement confirms our belief that CBD’s status as a mainstream wellness option has arrived,” Janet Rosendahl-Sweeney, founder of Phoenix Tears, said in a statement. The 7-Eleven rollout will begin in places that have legalized recreational or medical marijuana – California, Colorado, Florida, Illinois, Maryland, Massachusetts, Nevada and Washington DC – and are considered friendly territory for cannabidiol retailing. The CBD products are derived from hemp, not marijuana. Phoenix Tears plans to have its CBD products in 7,000 7-Eleven stores over the next three years. 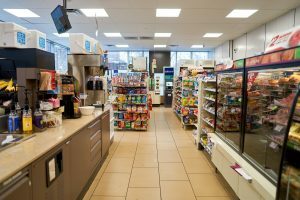 Roughly 155,000 convenience stores operated in the United States in 2017 compared with only about 43,000 drug stores, according to the Virginia-based National Association of Convenience Stores. Distributing CBD in 7-Eleven stores will “address the growing consumer demand for effective, safe CBD-based products that can now be easily sourced over the counter,” said Blake Patterson, president of MarketHub Retail Services. This is fantastic, good for them. I would hope they keep the CBD away from the dangerous products they sell like sugar, cigarettes and alcohol, not to mention the snack food isle loaded with chemicals and transfat. If they make the CBD available to children they will be much more healthy and be able to fend off all the other toxic poisons, that the roughly 155,000 convenience stores sells. Now we still have to protect them from the highly addictive gambling activities that seem pervasive in these types of stores. But, all in all we should give them praise for doing something like this. P.S. GW Pharma is most likely on the phone now with the FDA. Fascinating. Where will they get the CBD products from, China? No there getting it from a company in Colorado. I know a guy that’s friends with the guy who just signed a contract with 7-11. So it will be good quality not from China. yea, healthy #CBD, the thing that really get me is #Walgreen’s #RedNoseDay! If they really cared about our kids, they would stop pushing tobacco products behind every cash register! CVS did the right thing, tobacco kills, cannabis heals! CBD (and commercial hemp) is not legal in the US. Yet. How can this be true? Industrial Hemp was legalized in the 2014 farm bill and anything derived from it, so long as it contains less then .3 thc, is legal. HempIndustryDaily- you do our industry no favor by not confirming and running stories like this. The industry needs to review the work presented at ARVO and ICRS showing elevation of eye pressure thus risk for glaucoma in animal studies. There is a human study also showing this. The side effect needs to be researched. It’s good to see that the hard working franchisees of 7-eleven are going to be able to take advantage of this opportunity. It’s fake news folks. CBD is a controlled substance regardless of its origins. Thoughts on how this will effect the independent retailer of CBD’s? I would think that with the volume that 7-11 can do it will drive down the retail price significantly which will have a detrimental effect to the independent retailer. Would love to hear any thoughts from people who have experience in a product roll out of this magnitude. Hemp and marijuana are 2 complete different plants. How can it be said CBD is from a hemp plant but contains no thc?? Thc does not come from the hemp plant but from the marijuana plant. PURE CANNABIS OIL IS THE ONLY REMEDY FOR CANCER NOWADAYS.. MEDICAL THERAPY ARE NO MORE HELPING.. THERE ARE OTHER SOLUTIONS FOR CANCER AND NUMEROUS AILMENT YOU CAN THINK OF.ALL YOU HAVE TO DO IS REACH OUT FOR SOLUTION.